Matthew Koce is the CEO of hirmaa, a peak body organisation for private health insurance funds which share one or more of the following attributes, being not-for-profit, member owned or community based. Mr Koce, has been CEO of hirmaa for 3 years over which time the Association was grown from 18 to 21 health funds and coversover 1 million lives. He also represents hirmaa on the Private Health Ministerial Council and has sat on a range of other government committees and groups including the Federal Health Minister’s Industry Working Group on Private Health Insurance Prostheses Reform. Australia has a unique health system that comprises a mix of public and private providers, which together deliver outstanding outcomes and value for money for patents across the country. Private health insurance is a vital component of Australia’s health mix and an important contributor to the country’s health outcomes. Health spending in Australia accounts for 10 per cent of GPD, which is slightly above the OECD median and delivers superior health outcomes, particularly in areas such as life expectancy. Around 13.5 million Australians choose to have private health insurance, which provides immediate access to high quality care. In the 2015-16 financial year alone, insurers paid nearly $19billion in benefits to consumers. That is $19billion that would otherwise be picked up by taxpayers. Covering thousands of procedures, including two out of every three elective surgeries, a thriving private health sector is critical to keeping pressure off the already overstretched public hospital system, where waiting lists can run into the years. There are currently 37 registered private health insurers across Australia ranging from the large ASX listed and overseas owned for-profits to the small regional not-for-profit and mutual funds. As the peak body for 21 not-for-profit, member owned and community based health insurers, hirmaa is keen to ensure the continuation of a diverse and competitive health insurance sector that offers real choice for consumers. Existing solely to serve their membership, not shareholders, hirmaa funds are growing much faster than the industry average, enjoy significantly higher retention rates and return around 90 per cent of all premiums back to policyholders as benefits. The consumer ethos and focus of hirmaa funds is reflected in the findings of independently conducted surveys and reports by the Private Health Insurance Ombudsman (PHIO). For eleven consecutive years, hirmaa funds have participated in an independently run annual customer satisfaction survey. The latest survey received responses from more than 21,800 policy-holders with a staggering 97 per cent of respondents registering that they are satisfied with their health fund membership. These surveys provide hirmaa funds with an important tool for continual improvement and benchmarking and provide a further demonstration of their ongoing long term commitment to meeting the changing needs and expectations of consumers. The strong customer service performance of the hirmaa funds is also reflected in PHIO statistics, which show that while hirmaa member funds represented 9.6 per cent of the private health insurance market in 2016, they attracted only 4.6 per cent of annual complaints, well below their market share. 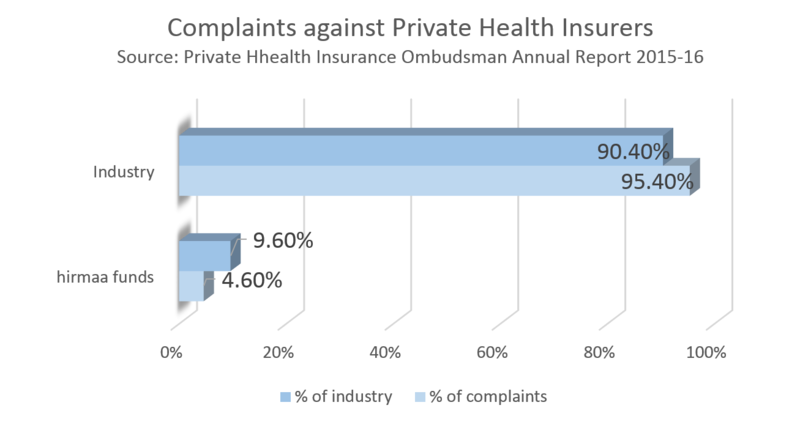 To put this into further context, the 4,416 complaints received in total by the Private Health Insurance Ombudsman in 2016 represented just 0.03% of all those Australians with private health insurance. While hirmaa funds continue to grow strongly and are valued by consumers, there is growing concern around the ongoing affordability of private health insurance. The fact that health insurance premiums are growing faster than inflation is undeniable. Primarily driven by growth in chronic disease and escalating costs of treatment with the introduction of new technology, premiums and participation are further impacted by the declining health insurance rebate, which is falling by around 1 percent each year, and high cost of living pressures and low wages growth. Consequently the percentage of Australians holding cover declined for the first time in 15 years during the December 2016 quarter. If this declining trend were to continue, it could have a severe impact on the public health system. As passive entities in the health supply chain, who rightly stand outside the patient doctor relationship, health insurers have very little control over the cost of the medical services for which they are required to pay. As such, insurance premiums have followed the movement of health costs, which are increasing much faster than inflation. If affordability pressure is to be relieved, consumers need to be empowered to make better informed choices across the entire health service supply chain. Giving consumers access to the information they need to take a more active role in their own healthcare will result in greater competition and better outcomes, while also placing downward pressure on medical costs. It is absurd that while consumers can search for a hotel online through a trip advisor service, neither they nor their GP can search for a hospital or surgeon online, basing their selection on sound authoritative performance data. Private health insurers are subjected to extensive transparency and accountability including publicly available and published data on complaints, premiums, benefits paid, management expenses, capital assets, member retention and policyholder growth. All of this information can be freely accessed by consumers, the media, consumer groups, comparators and industry bodies. This transparency provides a very comprehensive platform upon which consumers can select their health fund but this is as far as the publicly available transparency extends. It does not extend into the hospitals and medical specialists who are the real drivers of health inflation. There is no justifiable reason why such a high level of transparency and accountability cannot be extended across the entire health system. Why should consumers and their general practitioners not have access to information on re-admission and complication rates and out of pocket costs associated with medical specialists and hospitals in the public and private systems? The appalling failure by governments over many years to effectively regulate prostheses pricing provides an outstanding case study of why transparency and accountability are so central to a well-run health system. Under existing arrangements, private health insurers are required to pay a minimum benefit for prostheses as set by the Government through the Prostheses List. These benefits are significantly higher that what is paid by public hospitals and can be up to 300 per cent more expensive than the prices charged in comparable overseas countries, such as France. The effect of the prostheses list is such that the difference between what consumers paid for prostheses in private settings in 2013-14 versus what would have been the case if public sector rates had been used was approximately $720 million. hirmaa projects that this will increase to over $1 billion in 2018-19 based on current trends, representing an average additional cost of $181 to the holder of a hospital insurance policy. A complete lack of transparency around prostheses has resulted in the payment of undisclosed and secretive rebates or kickbacks between some large private hospital networks and the large multinational prostheses companies with some prostheses companies describing Australia as so lucrative that is a ‘Treasure Island’ and that being on the Prostheses List is a licence to print money. If we are serious about placing downwards pressure on premiums it is essential that the principles of transparency and accountability, which apply so heavily to health insurers, be applied across the entire health service provider chain including doctors and hospitals. The member-centric ethos of hirmaa member funds will ensure that any savings achieved through improved efficiencies and performance within the health service provider chain are returned to policy holders through reduced premiums, a fact that will be readily verifiable to the consumer, and the Federal Government, through existing publicly available disclosure provisions. Indeed, private health insurance premiums are subject to assessment by APRA and the Department of Health, and require the direct approval of the Minister for Health. A sustainable and affordable private health system maximises choice and complements Australia’s public health system. In order to ensure that the interests of the Australian consumer are best represented it is essential that consumer focused organisations such as the Consumer Health Forum and hirmaa work together through these complex issues.